Valerie Plame understands media. It’s not about facts. It’s not about pointing out individual pieces of misinformation from Donald Trump. 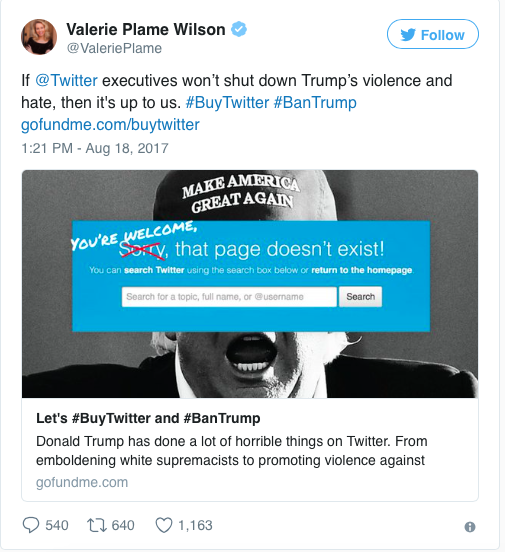 It’s about advancing new narratives, like “Let’s buy Twitter and kick Trump off.” The information side of that is cockamamie, but as a narrative it’s awesome and attention-getting. And idea-generating. She gets it. If only the Democrats did as well. ADVANCING THE NARRATIVE. This is what it’s about — launching new narratives. I’ve spent all year trying to explain there is an analytical reason for why President Trump should not be allowed to use Twitter for anything related to diplomacy. Back in January I pointed out that Twitter is too short, by half, to allow the communication of coherent ABT-structured narratives. And I’ve spent the year wondering what in the world is wrong with Congress that they can’t seem to see this as anything more than a laughing matter. Twitter is not a joke. It’s a source of rapid mass communication. It creates all sorts of mass MIScommunication, as I explained in that essay, using Stephen Colbert’s debacle as an example. Finally someone truly gets it. Former CIA agent Valerie Plame Wilson has taken the issue into her own hands with an attention-getting idea that is unlikely to occur, but that’s not the point. She is identifying the problem — that we’ve got a President who is well known to behave in a reckless manner. He simply should not be allowed to do it with Twitter. The last election showed how we have entered a new phase of The Information Society. Facts and accuracy now count for very little. What matters now is higher levels of information organization — namely narrative threads. Some how, some way the Democratic party has to grasp this, realize that Twitter is dangerous, realize that the last President used it very cautiously, but the current President is running roughshod with it. There has to be a way to stop this from happening. It begins by identifying the problem and getting everyone talking about it. The Democratic party has done nothing at all about this. It’s up to single citizens like Valerie Plame Wilson for now to at least try. She gets it.